Tart, sweet and addictively delicious. 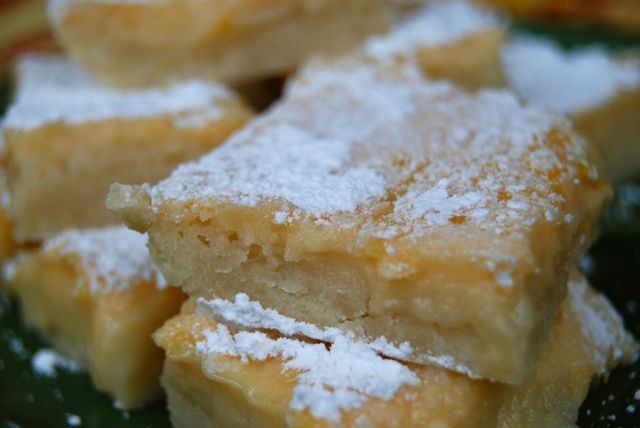 These lemon bars are the best I’ve ever had – low sodium or not. And they’re just so easy to make, there’s no reason not to. Adapted from Prevention’s Health Guaranteed Cookbook. To make the crust, preheat the oven to 350 degrees. Lightly grease a jelly-roll pan and set aside. In a mixing bowl, stir together the flour and powdered sugar. Cut the butter into the mixture until it resembles coarse meal. Press firmly and evenly into the bottom of the prepared pan. Place on middle rack in oven and bake 10-15 minutes, or until lightly browned. Remove pan from oven and transfer to a wire rack to cool. To make the filling, grate the rind from 2 of the lemons into a medium bowl. Cut all of the lemons in half and squeeze juice into the bowl. Whisk in the sugar, flour and egg substitute until smooth. Pour over the prepared crust. Place on middle rack in oven and bake 18-20 minutes, or until the filling is set when lightly touched in the center and the edges are beginning to color. Remove from oven and place pan on wire rack to cool. When completely cooled, sift the powdered sugar over top. Carefully cut into bars and serve. Lemon bars are best served within 48 hours of baking. Can you use regular eggs? If so, how many? Also, what is a jelly roll pan?